Today and throughout this year, Dominicans throughout the world will be celebrating the 50th anniversary of the canonization of our brother Saint Martin de Porres. I can trace the beginnings of my own vocation 'story' to the influence of Saint Martin de Porres. My late mother had a tremendous devotion to the saint and prayed the novena on a regular basis for her various needs and cares. She often attributed many of her blessings to the intercession of Saint Martin. In a certain sense, I grew up in the shadow of Saint Martin. As I began to know more about his life, the more impressed I became. I was struck how difficult he found it to even be accepted by the Order that he had such an influence on. I was impressed by his perseverance in the midst of great adversity. Only the cold-hearted could not be touched by his sensitivity to the poor and outcast. I was bowled over by the many 'magnificent' miracles attributed to him. I was humbled by his devotion to the Eucharist that sustained his life. To me he was and is the 'perfect' saint - and I am proud that he is a Dominican who can stand proudly beside the other great saints of the Order including Thomas Aquinas, Albert the Great, Catherine of Siena, Hyacinth and the hundreds of others. In the end, it was the response to a vocations advertisement in the Saint Martin Magazine about the Dominican vocation that led me on the journey to be a Dominican myself. I thank Saint Martin de Porres every day for this gift. The Irish Dominican province, more than most, has reason to the thankful to this wonderful saint - not just because many people over the years have joined the Order because of the attractiveness of this saint -but also because the many friends and benefactors of Saint Martin have contributed financially to the education of generations of Dominicans, and the support of our ministry in Ireland and abroad. 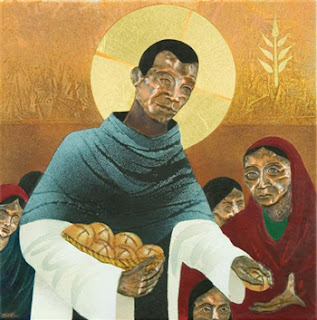 We would not be the province we are without Saint Martin de Porres. Most humble Saint Martin, whose burning charity embraces all, but especially those who are sick, afflicted or in need, we turn to you for help in our present difficulties, and we implore you to obtain for us from God, health of soul and body and in particular the favour we now ask.....................May we by imitating your charity and humility, find quiet and contentment all our days and cheerfuld submission to God's holy will, in all the trials and difficulties of life. Pray for us Saint Martin, that we may be made worthy of the promises of Christ. Labels: Saint Martin de Porres, vocation story. Spanish vocations video causes a stir!